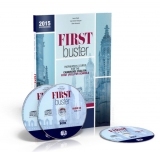 First Buster 2015 + 3 Audio CDs First Buster is an intensive exam preparation course designed to challenge motivated students and to encourage them to become independent learners. It features 20 units covering all First for schools topics, vocabulary, grammar and the skills needed for the four exam papers. 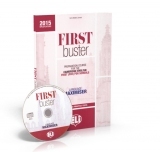 First Buster ...more..
First Buster 2015 Language Maximiser + CD audio First Buster is an intensive exam preparation course designed to challenge motivated students and to encourage them to become independent learners. It features 20 units covering all First for schools topics, vocabulary, grammar and the skills needed for the four exam papers. 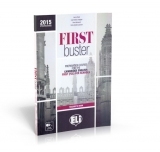 First...more..
First Buster 2015 Teacher's Book First Buster is an intensive exam preparation course designed to challenge motivated students and to encourage them to become independent learners. It features 20 units covering all First for schools topics, vocabulary, grammar and the skills needed for the four exam papers. 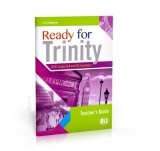 First Buster ...more..
Ready for Trinity - Grades 3-4 + Audio CD Ready for Trinity is a modern course created specifically for Trinity Graded Examinations in Spoken English (GESE) and Integrated Skills in English (ISE) exam. The exercises are designed to activate and stimulate the student's speaking and listening skills and to promote active class interaction and student...more..
Ready for Trinity - Grades 3-4 Teacher's Guide Ready for Trinity is a modern course created specifically for Trinity Graded Examinations in Spoken English (GESE) and Integrated Skills in English (ISE) exam. The exercises are designed to activate and stimulate the student's speaking and listening skills and to promote active class interaction and...more..
Ready for Trinity - Grades 5-6 + 2 Audio CD Ready for Trinity is a modern course created specifically for Trinity Graded Examinations in Spoken English (GESE) and Integrated Skills in English (ISE) exam. The exercises are designed to activate and stimulate the student's speaking and listening skills and to promote active class interaction and student...more..
FCE Buster - Preparation Course for the Cambridge ESOL First Certificate in English - Practice Book + 2 Audio CDs AIMS The book is to consolidate what is learnt in the course book FCE Buster - Self...more..
FCE Buster Teacher's Book The Teacher’s Book for FCE Buster - Preparation Course for the Cambridge ESOL First Certificate in English -...more..
New KET Practice Test + CD audio Full practice tests designed to help students prepare for the Cambridge ESOL revised KET examinations. Using New KET Practice Tests will help you to know what you have to do and how to do it! New KET PracticeTests contain full tests designed to help students...more..
New PET Practice Tests + 2 CD audio Full practice tests designed to help students prepare for the Cambridge ESOL revised PET examinations. Using New PET PracticeTests wilI help you to know what you have to do and how to do it! New PET PracticeTests contain full tests designed to help students...more..
PET Buster - PET Practice Tests + 2 Audio CDs - Preparation Course for the Cambridge ESOL Preliminary English Test consist of four complete Practice Tests designed by a team of experts in the field of Cambridge ESOL examinations to preparate students for the Cambridge ESOL Preliminary English Test. The material in PET...more..
PET Buster - Preparation Course for the Cambridge ESOL Preliminary English Test - Self Study Edition with Answer Key + 2 Audio CDs Course for the preparation of the Cambridge Preliminary English Test (PET) exam This course allows the student to prepare for the PET exam through a series of exercises introduced by stimulating topics...more..
PET Buster Teacher's Book The Teacher’s Book for PET Buster - Preparation Course for the Cambridge ESOL Preliminary English Test - Self Study Edition with Answer Key + 2 Audio CDs more..